Each requirement delivers a value for either wing loading, thrust-to-weight ratio or a relation of the two, and all values are plotted into one matching chart to define the aircraft design point (see in the end of this article). The first priority when choosing the design point is to minimize the thrust-to-weight ratio to be able to select or develop the smallest and consequently cheapest possible engines. The second priority is to maximize the wing loading which leads among other things to a smaller and principally lighter and cheaper wing. 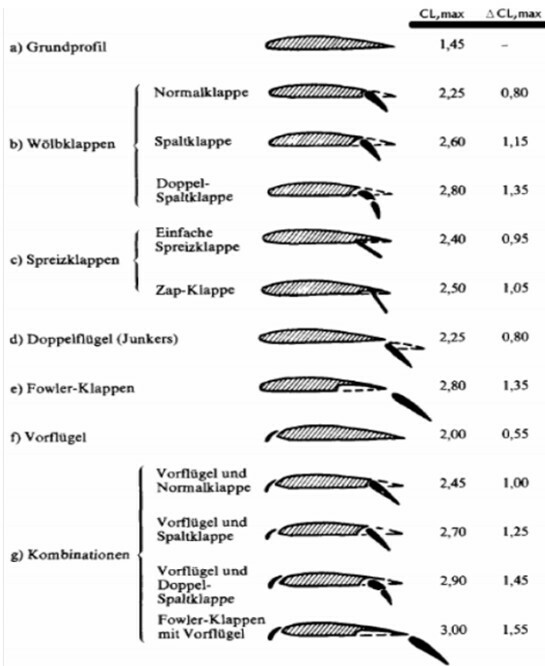 Below is shown an overview of the preliminary size method for propeller driven aeroplanes. This equation comes from a preliminary sizing method proposed by Laurence K. Loftin. The is divided by 1.23 for the landing requirements (JAR-25.125). 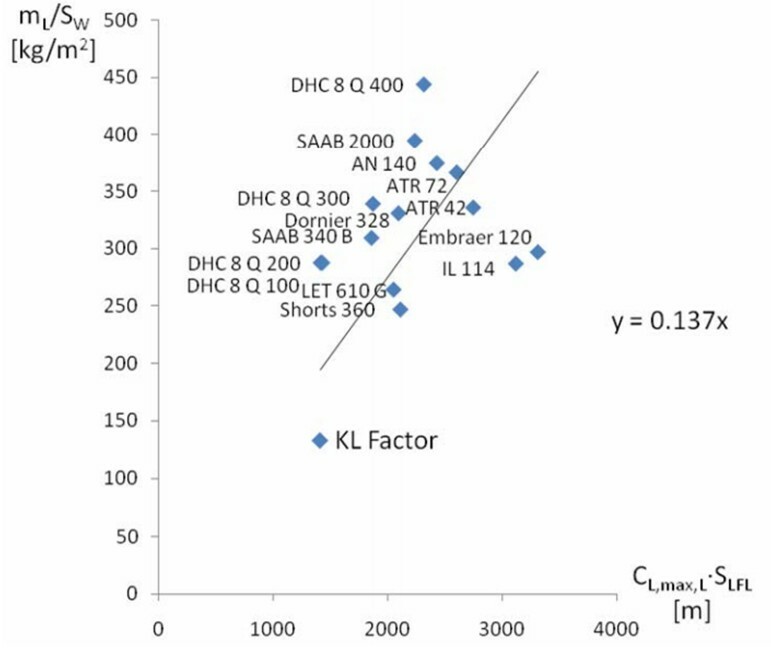 Figure 3: Statistical factor KL for calculating wing loading from landing field length and maximum lift coefficent upon landing for turboprop aircraft. 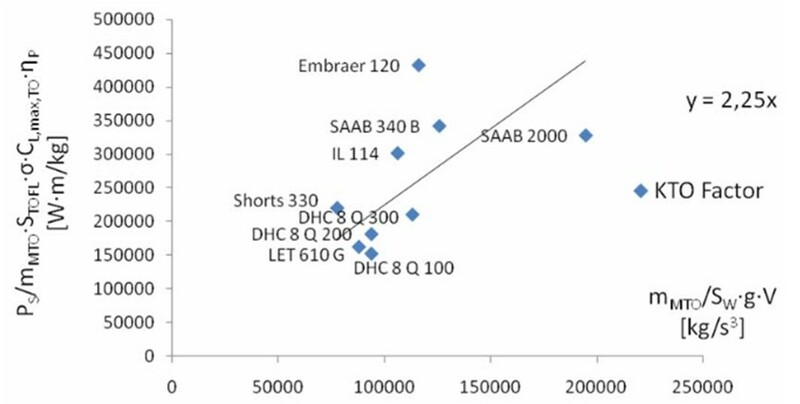 The Take-off distance AEO (all engines operating) is 115% of the distance required to fly over an obstacle of 35ft according to CS 25.113 aviation regulation. The propeller efficency ηP,TO for the turboprops depends of the average speed and disc loading (L=PTO/σ·ρo·SD, SD disc area ), see the figure below. 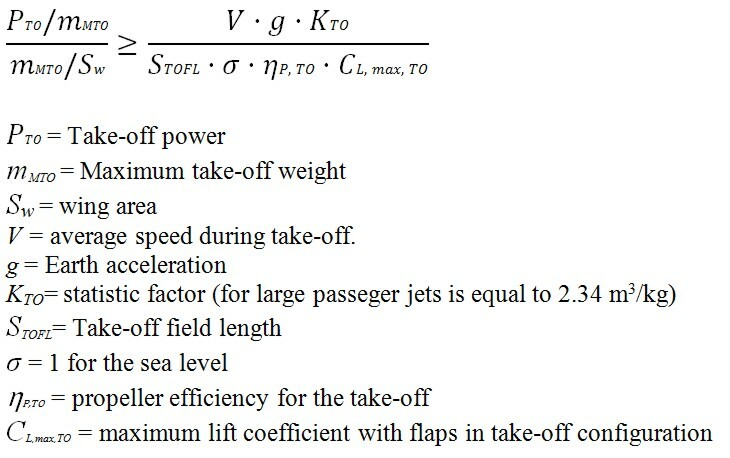 During the first iteration of the sizing procedure the take-off power is unknown, instead the propeller efficency is estimated from this graphic. In the second iteration the take-off power is used to get a better estimation by the figure #. The steady gradient of climb is between 2 % – 4 % in the second segment (the slope must be positive in every point). Note the propeller efficiency calculation requires iteration. Cruise calculation is performed considering a stationary straight flight at cruise altitude. 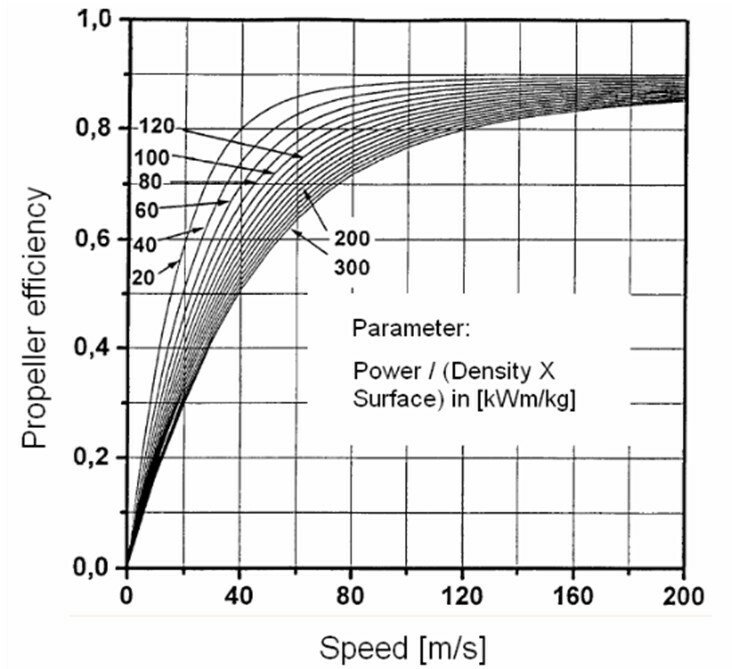 For the requirment of the cruise speed or Mach number the power to mass ratio and wing loading are determinated. To reach this scope two equilibrium equations are used: Lift=Weight and Drag=Thrust. Since the cruise altitude is not determinated in the beginng of the sizing, the power to mass and the wing loading are calculated for a range of possible cruise altutude. MCR is the mach number, a(H) is the sound velocity and it depends of the altitude H. To calculate the power to weight ratio during cruise flight we have to approximate the termsPCR/PS,TO, E=L/D. The lift to drag ratio depends mainly on the wing aspect ratio and the wing area. The glide ratio (E) is numerically equal to the Lift-to-drag ratio. The glide ratio is the ratio of the distance forwards to downwards (see the figure below). It is not necessarily equal during other manoeuvres, especially if speed is not constant. A glider’s glide ratio varies with airspeed, but there is a maximum value which is frequently quoted. Glide ratio usually varies little with vehicle loading however, a heavier vehicle glides faster, but maintains its glide ratio. In the table below are reported several values. This parameter is really important for the controlling of the flight. Experiments with lifting bodies show that a lift/drag ratio below about 2 makes landing very difficult because of the high rate of descent. 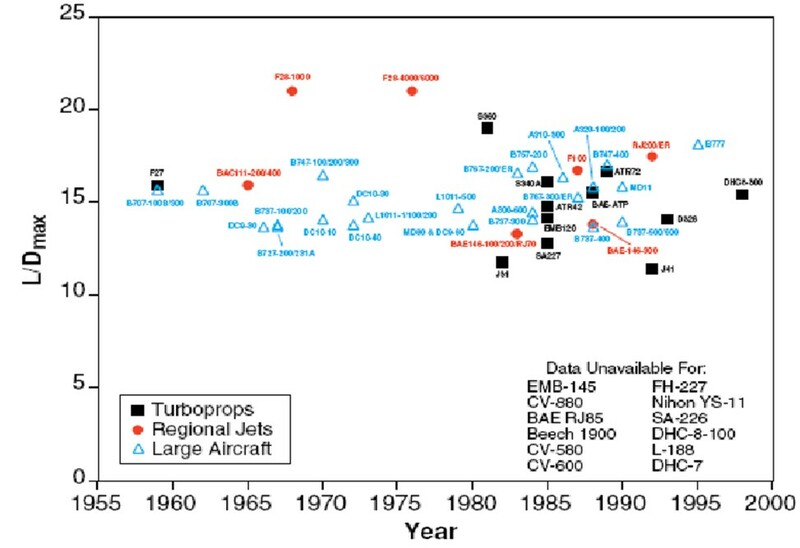 The graph bellow shows this influence for different types of aircrafts. 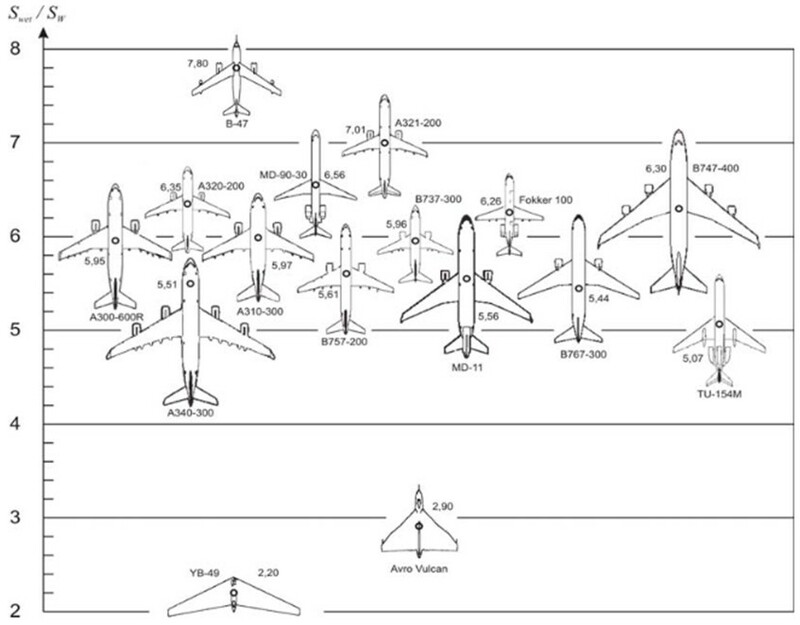 This diagram shows the right ratio Swet/Sw for different aircraft categories (Raymer 2006). 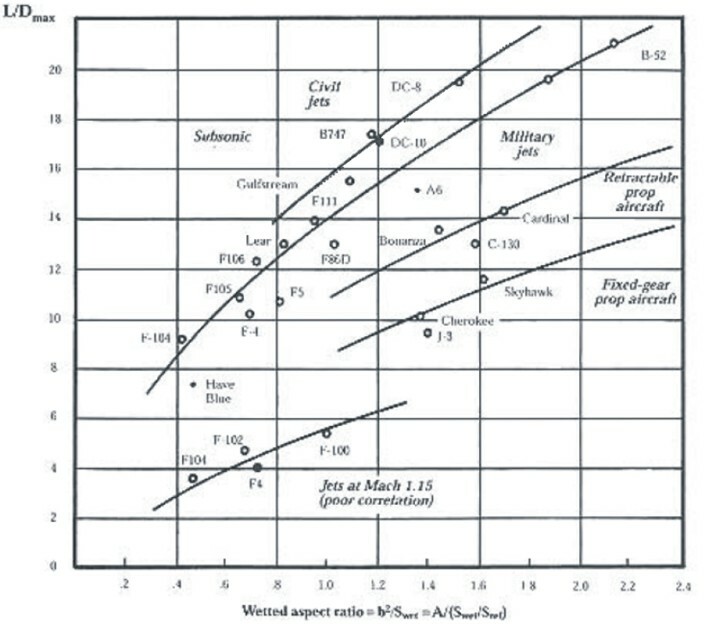 Figure 11: Aircraft plan forms and their relative wetted area S wet /Sw. For propeller driven aircrafts the value of V/Vmd is proven to be ≈ 1. Another possible estimation for L/D comes from statistics, see the figure below. 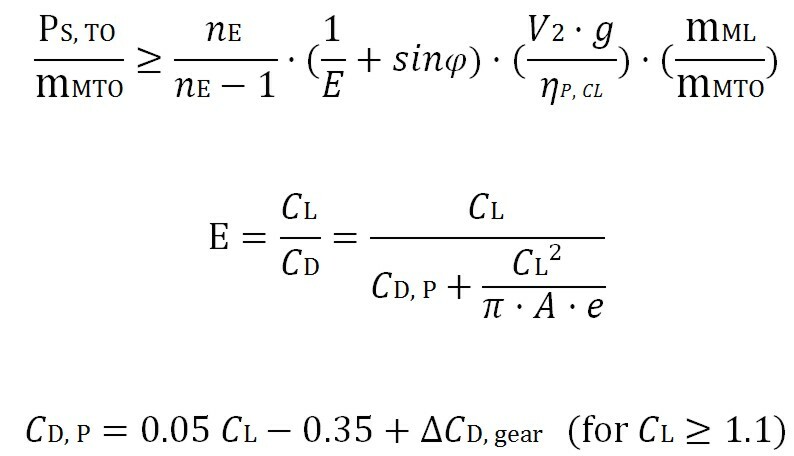 A, n and m to calculate the relative ammount of engine shaft power PCR/PTO as function of altitude (by σ) and Match number M.
Table 3: Tipical values for A, m and n.
For the turboprop is used generically P / Po= A·σn. A turboprop is a gas turbine driving a propeller. This gives a relatively high weight per unit of cruise thrust, caused by the weight of the propeller and especially of the reduction gear. However, when comparing to a turbofan, for example, the disadvantage of low cruise speed and low thrust to weight ratio must be balanced against the advantage of good fuel economy. The propulsive efficiency for a turboprop remains nearly constant during cruise. Also its performance is much superior to that of a turbojet or turbofan engine during take-off and climb. An aspect concerning costs is also an advantage, because the maintenance cost is much less and the turboprop engine is more reliable. The term σ provides the corresponding variation of the power with height, it is the parameter which influences directly the combustion. The n coefficient comes from the engine data from the manufacturer, and it may vary differently from one engine to another. The results depends on the height and can be represented into the Matching Chart. The relative fuel mass and operating empty mass are design parameters. 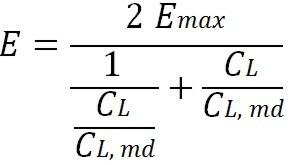 The relative fuel mass needs an estimation for obtaining the maximum take-off mass. The fuel is used during all flight phases, including taxiing, as shown below. In every flight phase can be defined a mass fraction, the mission fuel fraction Mff helps the calculating of the fuel consumption for the entire flight. Scr is the distance flown in cruise. The matching chart helps to graphically solve a two-dimensional optimization problem the final. The flight mechanic calculations for propellers are based on power P, whereas calculations for jets are based on thrust T. The two dimensions represented in the matching chart are power to weight ratio and wing loading. When choosing the design point we have to consider achieving the smallest possible thrust to weight ratio (respectively power to mass) at the highest possible wing loading. The ideal case is when all the lines come together. 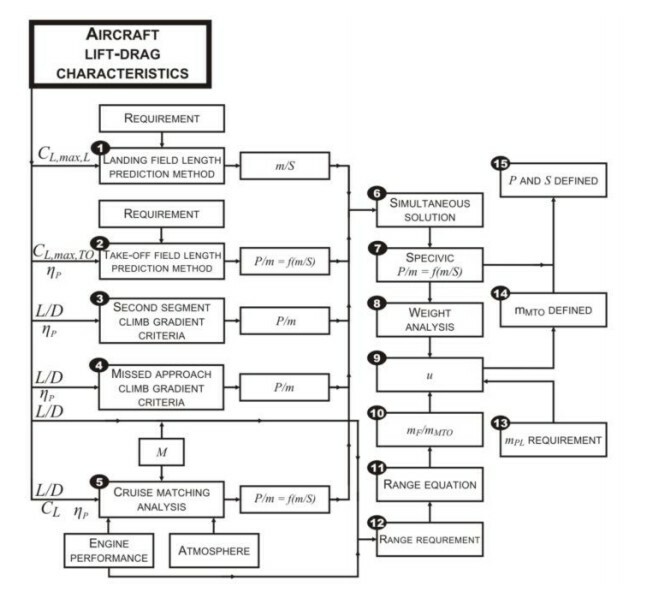 This entry was posted in Aircraft Design and tagged Approach, chart, climb, Cruise, distance, drag, Landing, lift, Mach, matching, Missed, Power, Preliminary, sizing. Bookmark the permalink.